Greenland’s massive ice sheet has survived worse periods of warming in the past, and there's no reason to expect catastrophe. Even when Greenland loses a small fraction of its ice, sea level goes up in a big way. Greenland's mass balance is estimated by the Gravity Recovery and Climate Experiment (GRACE) satellite, which measures shifts in Earth’s gravity field. The GRACE data offers a complete picture of the entire ice sheet. Figure 1 shows the ice mass changes in Greenland from April 2002 to February 2009. The blue line and crosses show monthly values of ice mass. The red crosses have seasonal variability removed. The green line is the best fitting quadratic trend. The best fitting trend finds that Greenland ice loss is accelerating at a rate of 30 Gigatons/yr. Greenland's mass loss doubled over the nine-year period. 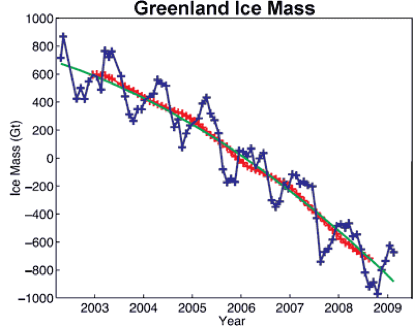 Figure 1: Time series of ice mass changes for the Greenland ice sheet estimated from GRACE monthly mass solutions for the period from April 2002 to February 2009. Unfiltered data are blue crosses. Data filtered for the seasonal dependence using a 13-month window are shown as red crosses. The best-fitting quadratic trend is shown by the green line. I. Velicogna, “Increasing rates of ice mass loss from the Greenland and Antarctic ice sheets revealed by GRACE,” Geophysical Research Letters 36 (2009), L19503, Figure 1, doi: 10.1029/2009GL040222. The long-term trend since the 1970s is accelerating ice mass loss. This is confirmed by gravity satellite measurements over the past nine years, which find that the rate of ice mass loss has doubled over that time period. The contribution of Greenland's ice sheets to rising sea levels is continuously and rapidly growing.